Konst Pinger 1.31 free download. 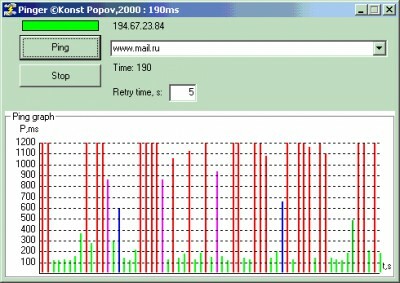 Konst Pinger is a program for ping and trace internet host. Konst Pinger is a program for ping and trace internet host. Ping host that you choice. Show results in graph mode. Change delay time for pinging. Store hosts in a file. Minimized to system tray and background mode ping. Trace route to host. WhoIs support with advanced futures. Write result to log file by host name or into one. Customize limit points for ping graph. New color level capabillities added. Advanced log files analyses with save to bitmap capabilities. Send ping statistics by ICQ SMS gate. This program quickly and conveniently will allow You to work with a collection of Your VB projects. Ping Alert is a useful ping utility that can automatically ping and keep pinging a host, maximum to 100 hosts. Easy Ping is a tool that contains Ping, Trace route and Net Stat functionality packed and a simple to use graphical interface. FREE Visual replacement for the standard ping utility. Auto Ping is a free and advanced tool for ICMP pinging. Link Monitor is an application that will check an Internet or network connection by pinging a specified host. Enhanced Ping is a small Windows application that allows you to ping multiple hosts (upto a maximum of five) simultaneously. Do you want to know if all your Windows 2003-XP-2000-NT servers are alive and pinging? Do you want to receive a pop-up message when one of them is not running anymore? FREEping is a free ping software utility which will ping all your IP addresses in free-definable intervals. i00 Trace IT finds routes to an IP or domain. Win32Whois is a useful, small and efficient Whois client that is capable to retrieve domain information for most of the common TLDs (top level domains).